It's Time to Order your 2019 Official Dust Devil Ranch Calendar! Once again, one of our wonderful, generous supporters put together our official 2019 Dust Devil Ranch horse calendar! Thank you, M! Use this 2019 Dust Devil Ranch horse calendar at home, in your work-space or office, or barn to track event dates, schedule meetings, or monitor ongoing projects. Calendar features 12 beautiful, full-color images of horses from the ranch, and it's suitable for hanging on the wall for easy viewing. 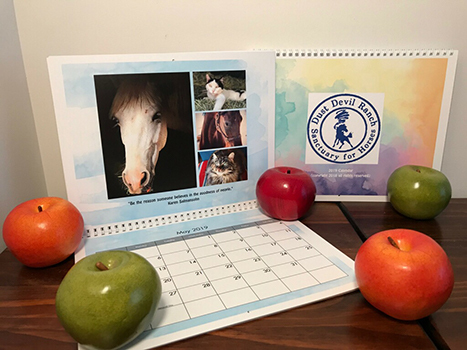 Your 2019 horse calendar will help you stay organized and meet your scheduling needs for the entire year. We're offering our 2019 Dust Devil Ranch horse calendar for a donation of $25 each (shipping is free). They would make a great Christmas gift! 100% of your donation will go towards winter hay to keep the horses' bellies full this winter. We only have a limited quantity available, so place your order now, before they're all gone! There are never enough Thank You's to Ginger & her Ranch Sanctuary for their dedication. SO THANKFUL FOR DUST DEVIL RANCH AND THE CARE PROVIDED TO THOSE ANIMALS. What you do is amazing! Love my rescue horse "Goose". Thank you for bringing us together! A wonderful rescue program for our beloved equines who then benefit us humans daily. Honoring & still loving my precious pussycat, Rosie,who passed last year at the sweet age of 20-years old. Looking forward to the 2019 DDRS4H calendar, and glad to help by a little hay for the Hay Barn! !